The Crew Return Vehicle (CRV) and the Russian Soyuz Capsule. In ORBITAL MANEUVERS the crew of the space shuttle Endeavour delivered the CRV to the empty space station as part of their mission along with servicing a science satellite. In reality, the CRV never reached space - not even came close - and the job of an emergency return vehicle fell to the Russian Soyuz capsule. This has limited the number of astronauts crewing the station to three, unless a second Soyuz can be docked at the station. Read on for more information about the CRV and the Russian Soyuz capsule. The crew return vehicle, or CRV, was conceived as an emergency return vehicle that could carry up to 7 passengers safely back to Earth. This would allow the space station to increase the crew size from three to seven, limited to three because the docked Soyuz capsule could only carry three people. 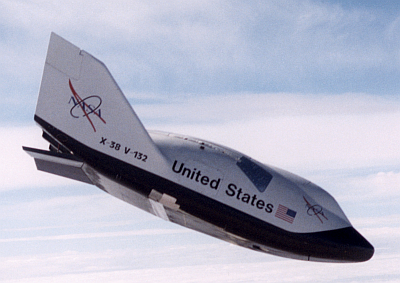 The craft was a lifting body and would glide back to the earth in a similar fashion as the space shuttle, but it did not have wheels and would land on skids using a large parafoil to slow its descent. Onboard computers would automatically control the descent, but there was the ability for manual control if needed. 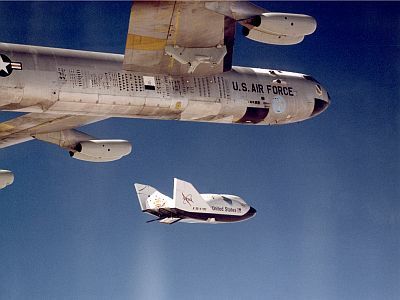 The prototype for the CRV, the X-38, was only built to 80% scale and was tested by dropping it from a NASA B-52, at altitudes up to 45,000 feet (13,716 m). 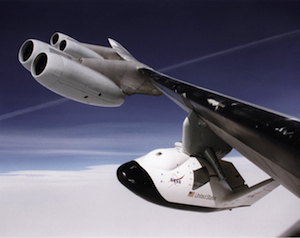 The actual craft would be about 31 feet (10 m) long, 15 feet (4.8 m) wide and 10 feet (3.3 m) high, and would just fit inside the cargo bay of the shuttle, which would deliver it to the station. However, due to development costs and budget cuts the CRV project was canceled in April of 2002. 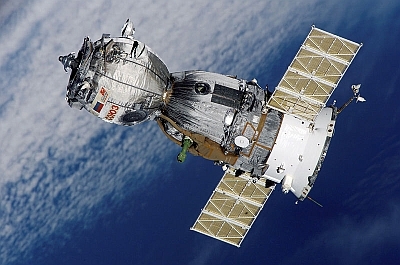 In the novel, the Soyuz provides an escape for two cosmonauts aboard the damaged MIR station. The Soyuz capsule, the workhorse of the Russian space program has been in service since 1966 and continues to ferry cosmonauts and astronauts to the International Space Station. It also has the distinction of bringing the first space tourist (and every one since) to the space station - Dennis Tito, in April 2001. With the pending retirement of NASA's shuttle fleet, the Soyuz will be the only source of transportation to and from the ISS until the Orion/Constellation project begins service in 2014. The Orbital Module (left-most section in the image) houses equipment pertinent to the mission. The Reentry Module (middle section) houses the three cosmonauts for launch and reentry. 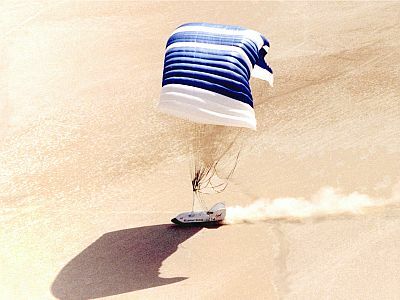 Reentry is over land using parachutes. The Service Module (section with solar arrays) contains power supplies, communication and control electronics as well as the propulsion system. The spacecraft is about 7.5 meters long with a diameter of 2.7 meters, with the solar arrays extending over 10 meters. The Soyuz has a mass of about 7220 kg. As of May 2009, there have been two Soyuz capsules docked at the station allowing the crew compliment to grow to six.